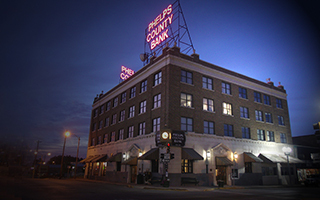 Phelps County Bank (PCB) is a community bank owned by the employees through an Employee Stock Ownership Plan (ESOP). PCB has this simple mission: always strive to exceed expectations and provide each customer with a level of service that only comes from working with an employee-owner. PCB was established by local citizens in 1963. The majority interest was purchased by Don Castleman in 1971, and he subsequently purchased all but 3% of the stock through a one bank holding company by 1978. The ESOP was established in 1980 as a profit sharing plan which would let employees share in the growth of the bank. The first purchase was 5% of the bank stock from Don Castleman. PCB purchased a bank in St. James, Missouri in 1984. In order to bring the 15 employees from the merged bank into the ownership plan, Don Castleman sold another 8% of the stock to the ESOP. By 1987 the bank's assets had grown and the ESOP and the stock had significantly increased in value. Management was able to use the ESOP as a recruitment incentive and turnover decreased significantly as employees were seeing their efforts rewarded in their stock account. A plan was put into place to use the ESOP as an orderly way to transfer ownership since Don Castleman was willing to sell his remaining stock to the ESOP. The ESOP purchased an additional 22% of the stock in 1988 bringing the employee ownership to 32%. A tremendous effort was made to share information with employee-owners and to gain their commitment to make 100% ownership possible. In 1991 the ESOP purchased an additional 36% of the stock and completed the purchase of the remaining stock in 1993. Don Castleman sold his stock to the ESOP because of his belief in the employees and their ability to keep the bank profitable and independent.